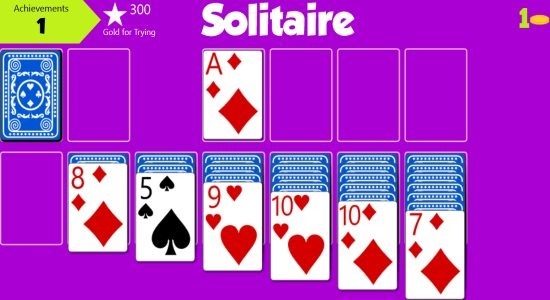 Solitaire Pro is a free Windows 8 card game app available under the ‘Games’ category of Windows 8 Store. It’s the classic version of the popular Solitaire card game. This card game Windows 8 app comes up with everything you expect from a quality solitaire game such as amazing graphics, animations, hints, achievements, score board, undo etc. all the possible functions. What I Liked About Windows 8 Card Game App..
What I really liked about this Solitaire card game for Windows 8 is the amazing full-screen interface that makes you even interested to concentrate on solving the cards only. Also, the bundle of colorful themes that lest you change the theme of cards along with the background screen. Themes such as sea port, ice age, pretty pink, and more. Another interesting thing is the soothing music that the app produces while playing the game. However, you can mute it if you do not like the music. You can take hints, track scores instantly, etc..
And What I Did Not.. The most disappointing part here at Solitaire Pro app is the lack of saving the game. Yes.. you can not save the currently playing game to play it later. Either you finish it now, or forget it because the app will bring you a new game the next time you open it. Lets you play the popular card game in full-screen mode. Lets you change the theme easily. Plays a soothing music while playing the game with optional mute button. Options such as redo, hint, new game are available. It’s a free Windows 8 card game app available under the ‘Games’ category of Windows 8 Store. Open the search bar i.e press ‘Win+Q’ key combination to open the search bar. Enter Solitaire Pro and this will get the app for you. Click on the ‘Install’ option to download the app. You are done.. check your Windows 8 start menu screen, you will find the app located there. In short, Solitaire Pro is a nice Windows 8 card game app for those who are addicted to solitaire and now want to play in the interesting graphics in Windows 8. 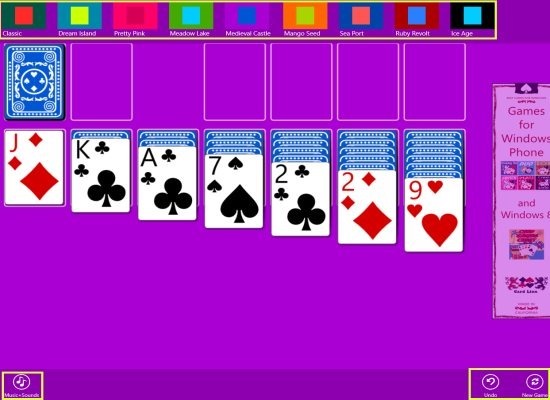 Go ahead and download Solitaire Pro Windows 8 card game app now.